It also boasts a state-of-the-art online casino where you can play your favorite games from the comfort of your own home. Bundle this up with first class customer service and competitive bonuses with low rollover requirements, and you can easily see why Bovada.lv has been around for many years and will continue to do so for many years to come. So if you deposit $500 you will have $750 to bet with within half hour of your deposit being processed. Rollover on the bonus is 5x for sports, 5x for horses, and 30x in the casino and you must rollover both the initial deposit and the bonus amount. If you make a withdrawal before you have met the bonus terms, all bonus funds and any money earned by wagering the bonus are forfeited. Like many sportsbooks, Bovada is encouraging its customers to deposit via Bitcoin, touting it as the premier way to get your money into your account. They cite Bitcon as being fast, secure and holding no transaction fees associated with traditional payment methods. Bovada will also accept deposits via MasterCard and Visa credit cards and Visa debit cards, and also via MoneyGram, Western Union, Bank Wire and Rapid Transfer. Deposits are processed quickly so you will be wagering in next to no time. Withdrawals are very fast, and are available via Bitcoin Skrill, Neteller, Rapid Transfer and check by courier. When you come to navigate your way around the site, you will do so with consummate ease. Within a couple of mouse clicks you will find your favorite sporting event, have seen some industry-leading betting odds, and have your wagers placed. 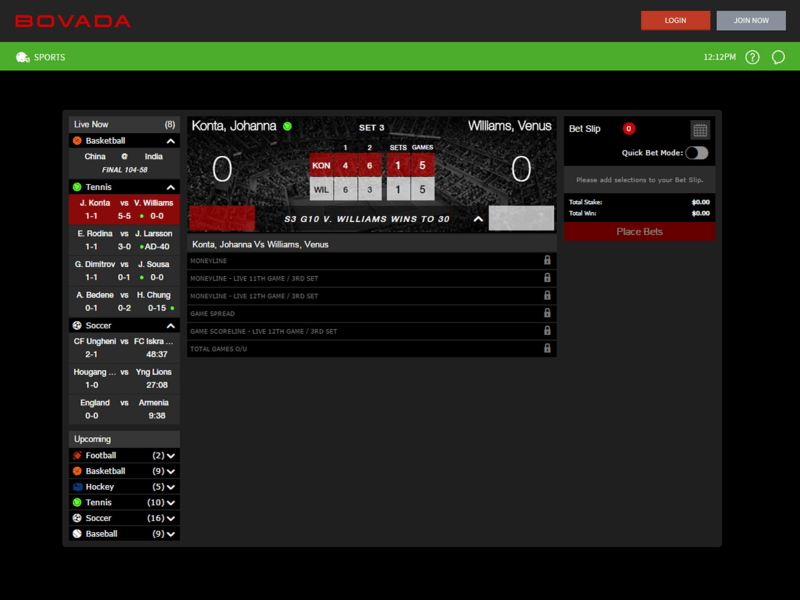 We cannot stress how easy Bovada’s site is to use. All of this professional package comes bundled with a name you can trust, one that has been offering online gaming since 1994. You don’t thrive for more than 20 years in this industry without having something special about you, and Bovada is certainly a special entity. First rate customer service for peace of mind in case anything goes wrong, a large sign-up bonus with competitive rollover requirements, superb betting lines, a plethora of betting markets, and the ability to play casino games using one account all add up to an amazing experience when you use Bovada for your wagering needs. Overall, Bovada bills itself as one of the major players in the sports betting world and it lives up to the hype. Join Bovada for free today and experience one of the best, if not the best, American-friendly sportsbooks on the planet. Like most sportsbooks, Bovada has both minimum and maximum deposit amounts. The minimum you can deposit with Visa, MasterCard, Rapid Transfer or Bitcoin is $20 – you can deposit $50 over the phone with Visa and MasterCard – while the maximum deposit is $1,000 ($5,000 for Bitcoin). Depositing the minimum yields a $10 bonus, while getting your hands on the full $250 welcome bonus requires a $500 deposit. You will find the rollover requirements very competitive at Bovada because they only require you to rollover the bonus and deposit amount five-times (5x) when you are betting on sports, and five-times (5x) when you are betting on horse racing. In the casino, the rollover is 40 times (40x). Withdrawing before the full bonus rollover requirements results in the remaining bonus and any winnings made from the bonus funds being forfeited. While Bovada does not have a horse racing specific bonus, you can still claim the 100 percent up to $250 welcome bonus and meet the rollover requirements by betting on a wide variety of horse racing. Rollover for horse racing bets is currently five-times (5x). Bovada does offer weekly cashback on your horse racing action. You receive three percent on all straight bets: win, place, and show, so long that place and show wages pay out better than $2.10 or $2.20 on a $2 bet. The cashback increases to five percent for all exotic wagers such as Quinella, Exacta, Trifecta, Superfecta, Daily Double, Pick 3, Pick 4, Boxes and Wheels. All horse racing cashback is paid on a Tuesday. Casino players can claim up to $3,000 in welcome bonuses at Bovada, which is right up there among the biggest casino bonuses in the industry. There are two types of casino bonus available, a 100 percent match bonus up to $500 for slots, and 100 percent match up to $250 bonus for other casino games. Each of the bonuses can be redeemed four times, and these have rollover requirements of 30 times (30x). To claim the slots bonus use the bonus code BCBSLOTS, and to bank the other games casino bonus enter the bonus code BCBCASINO. Bovada also offers a $10 bonus for trying out their mobile casino. Wager more than $250 between Monday and Sunday and the bonus is yours to collect. On table mania Tuesdays, play any of Bovada's casino table games, bet $250 or more, and you will receive a $10 bonus the following Wednesday. With reel it in Thursdays, play at least $500 in slot and you'll earn a $20 casino bonus with a 20 times (20x) rollover. The Red Room is Bovada's casino VIP rewards program. Its members enjoy exclusive cash rewards and offers; score weekly deposit bonuses; receive unparalleled, personalized customer service and so much more. They also benefit from special rewards and personalized customer service, exclusive only to Red Room members, and double the regular Bovada Casino rewards. Here’s what you can expect: weekly deposit bonuses exclusive Red Room offers; convenient deposit options and free expedited payouts. Red Room members are also eligible for exclusive prize and bonuses packages. Bovada runs regular promotions during the various sporting seasons, especially when there is a major sporting event taking place such as the Stanley Cup, the Super Bowl, or the FIFA World Cup. Long running promotions include the 100 percent up to $250 welcome bonus and a superb refer a friend bonus where you receive 200 percent of your friend's first deposits up to $100, and you can refer as many friends as you wish. Bovada so wants to encourage you to deposit to your account via Bitcoin that they have induced an added incentive to make it an even more attractive option. Now you can score a 150 percent Bitcoin Casino Match Bonus up to $1,500 – redeemable three times – and a 50 percent Bitcoin Match bonus up to $500 to bet on sports when you join Bovada. Use the promo code BVCBITCOIN150 for the casino offer and the code BVSBITCOIN50 for the sportsbook offer. Close Visit Bovada and see for yourself... Ok! Let's Check Out Bovada!